Hayley Carlson is the inspiration and passion behind Ketcham Farm. 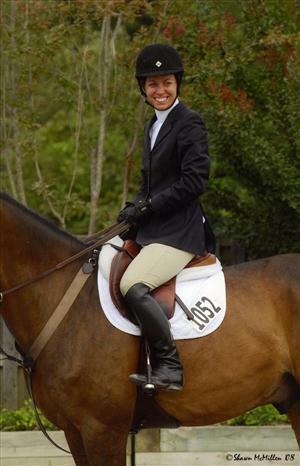 Hayley rode as a young rider and returned to her sport following college. She has spent the past few seasons developing her abilities as a jumper rider. Aboard her number one horse, T. Naralda, Hayley finished 2008 leading the standings in the WIHS league and third in the standings for the NAL adult jumpers. Hayley and “Tino” went on to finish fourth at both finals. She began preparing for the 2009 season by showing to a fifth place finish in the amateur owner classic at the national horse show at Syracuse, NY. Hayley continues to compete throughout the Northeast and in Wellington, Florida. Hayley spends much of her time in the saddle helping produce the farms younger and upper level jumpers. Hayley is a very involved owner who loves to learn any piece of horsemanship that may enable her horses to thrive on quality care. Toby is the owner of two horse farms – both named Ketcham – as well as a series of successful earth products construction and recycling companies across the NY/NJ region. While not a rider himself, Toby has applied his knowledge of construction, soils and earth products and successful project management to the creation of a footing’s and ring construction service for the show jumping industry. When not at work, Toby is in every corner of the farms operations. He lends his expertise to construction, mechanical and business facets of the farm. His fun and supportive personality adds to the farms upbeat atmosphere and success. Toby takes the occasional riding lesson and is often seen practicing his posting around the farms grand prix field.